The Koi fish is one of the most beautiful types of fish. Though Koi fish aren’t all the same color, the orange pigment is the most common on the fish scales. Koi fish also have long whiskers. Their interesting appearance distinguishes them from other fish types. Koi fish are admired for their beauty. They are most commonly domesticated so that people can enjoy looking at them. Many people love having a Koi fish pond for a lot of reasons. Some of the reasons include reducing stress, for aesthetics, to increase a home’s price value, and for good luck. However, as a Koi fish pond is larger than just caring for a fish in a fish bowl, people often forget that it needs just as much treatment. As a Koi fish pond owner, you must remember that your Koi fish are still living creatures. You should put in the effort to take care of them, even if you think it might be a lot of work. Step one of making the Koi fish care process easier for yourself is to remove the Koi fish when you want to clean the pond. It will be a lot more difficult to clean the pond if the fish are still swimming inside it. You will need a large fishing net to get the Koi fish out. Once you’ve (gently!) netted your koi fish, put them in a temporary tank with some of the pond water, so they do not need to adjust into a new environment. This part might even be the hardest part of the cleaning process, but you will need to do it in order to properly care for your Koi fish pond. Draining the pond is super important for Koi fish care. Draining your Koi fish pond is one of the biggest reasons why you need to remove the fish before you begin cleaning your Koi pond. Once you’ve drained the pond, you will be able to remove any debris, mud, or dirt from the sides of the pond. You can also use a hose to get rid of any unwanted plants or filth in your pond. Then, use your hose to also refill the water in the pond. Now the water will be fresh and clean for the fish to swim in. Koi fish care is not as hard as you may think! Feeding is another significant topic to discuss regarding proper Koi fish care. Make sure that you are feeding your Koi fish the proper amount of food that they need. Overfeeding them will contribute to the sludge and filth in your pond. When you overfeed the fish, they will produce more waste. This helps the algae surrounding your pond to grow. In order for your fish to live happily, you need to properly care for their health. It is better to underfeed them than to overfeed them. If you forget to feed your fish one day, make sure to feed them the next day. But do not give them more than they need, even though you didn’t feed them the day before. Koi fish care involves keeping track of the pond’s water temperature. Koi fish require specific water temperature and conditions in order to live a healthy life. Make sure that you take that into consideration as you clean out your Koi fish pond. Your pond should be filled with about 1000 gallons of water, depending on how big it is. The pond should also be somewhere between three and four feet deep. This will make it easier for the fish to swim towards the bottom, colder water when it is hot outside in the summer. Your fish need to be able to adapt to the water temperatures in the pond. The Koi fish can survive in most temperatures that aren’t too cold. If your pond will freeze because of the colder winter temperatures, make sure to remove your Koi fish from the pond. You don’t want your Koi fish to turn into fish-sicles! If the temperature of your water gets under 40 degrees, do not feed your fish. This is because that temperature level causes the bio-filter to stop working. This will deteriorate the pond’s water quality. Here’s another useful Koi fish care tip: you should make sure to frequently check on the water in your Koi fish pond. When you check on the pond water more often, you’ll be able to notice its condition before the water gets too filthy. Take notice of how much algae is in your pond. If you’re seeing an increase in algae, you might be overfeeding your fish. Thus, you should also remember to give your fish the right portion of food. In addition, you should also check for cleanliness in the water. If your pond’s water constantly becomes dirty, you may have a problem with your pond’s filter. Make sure that the water filter in your pond is working properly. You may need to change it every now and then in order to maintain cleanliness in your pond’s water. Moreover, if you find that your water is never clear, you may want to try the water column clarifier product. The water column clarifier carries various vitamins to add to your water and keep your fish healthy. This product is also eco-friendly. 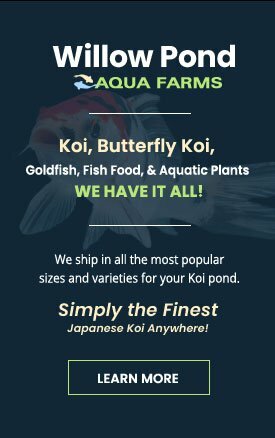 Make sure to stock up on all of the right equipment you need for koi fish care. Some of the equipment you will need to use include: an excellent filtration system, a strong water pump, an aeration system, a protein skimmer, and an ultraviolet sterilizer. You will need the filtration system in order to provide your pond with the cleanest water. The water pump will help you pump water in and out of your pond. Similarly to the filtration system, the protein skimmer will also help keep your pond’s surface water very clean. The aeration system will take care of the oxygen levels in the pond. The oxygen in your pond is extremely important for your fish’s health. Aeration protects the fish in the summer by increasing the oxygen levels in the water. In the winter, the aeration system will make a hole in the ice to enable gas flow when the water freezes from the cold temperatures. An ultraviolet sterilizer is also a useful piece of equipment to have for koi fish care. Ther sterilizer can kill algae and other gross bacterias in your pond. The sterilizer utilizes the ultraviolet rays in order to get rid of all of the harmful particles swimming among your fish. Having all of this equipment will make things a lot easier for your when you’re trying to care for your Koi fish and clean the pond. If you’re a new Koi fish pond owner or you’re just not sure about what to do to clean your pond, talk to a professional. Don’t wait for your pond water to become dirty and disgusting. Your fish’s health is on the line! If you have any doubts in your abilities to properly handle Koi fish care, do not hesitate to reach out to the experts. There are services that bring a professional to your home to test the water in your pond. After they test the water, they can assess what needs to be done to improve your pond. Use the time with the professional to your advantage. Ask all of your questions to get the answers you need about Koi fish care. Let the professional tell you about the products and services they offer for Koi fish care. They might be able to teach you or give you some tips next time you decide to clean out the pond yourself. Asking for help is always a good idea when it comes to keeping your fish nice and healthy. Your Koi fish are beautiful and graceful underwater creatures. They deserve the best care in order to live long and healthy lives. Koi fish can live up to 25-35 years, as long as you take good care of them. Get to know your fish. Each fish will have its own personality. Their pigment color is not the only aspect that defines them. Commit to always keeping your Koi fish pond as clean as possible, so that your fish can lead long and healthy lives. If you ever feel like you’re not sure about Koi fish care, do not be afraid to ask for help. Please contact us for any questions you have about Koi fish care and pond maintenance. We would love to help out!